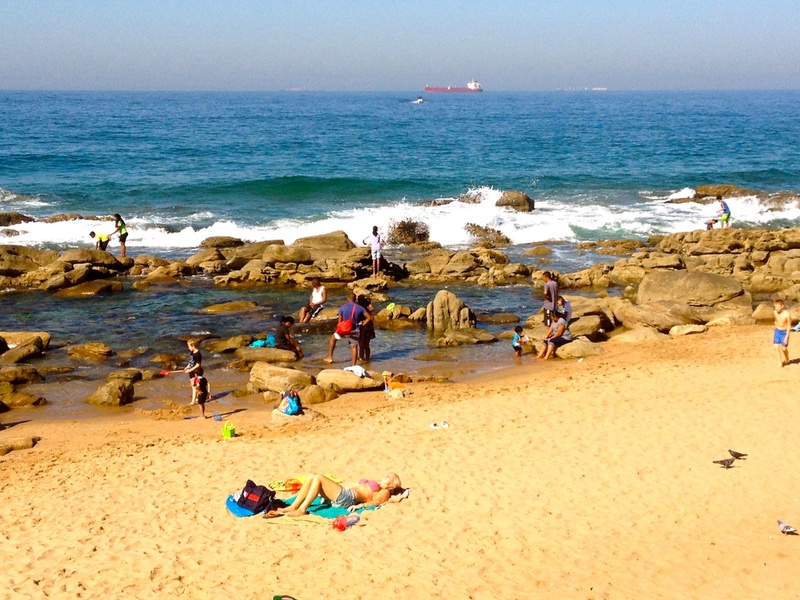 It’s almost winter here in Umhlanga, but the weather is perfect for a day at the beach. Lots of activity here, and only one person seems to be relaxing. 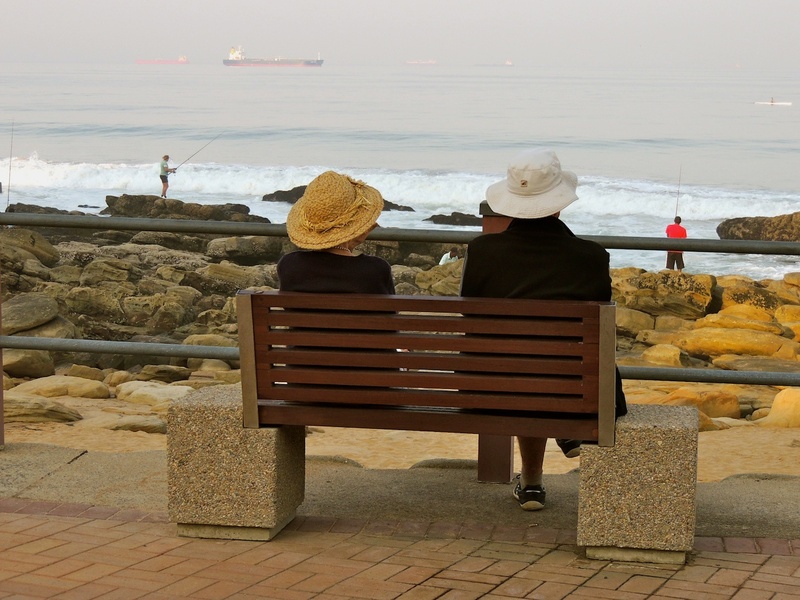 The day after we arrived here in Umhlanga Rocks, we went for our favourite walk along the promenade. This couple were ‘sitting ducks’ just waiting to be shot for Jude’s ‘Benches at the Beach’ challenge. I’m not sure which of these two images I prefer, so I’ll show you both of them. 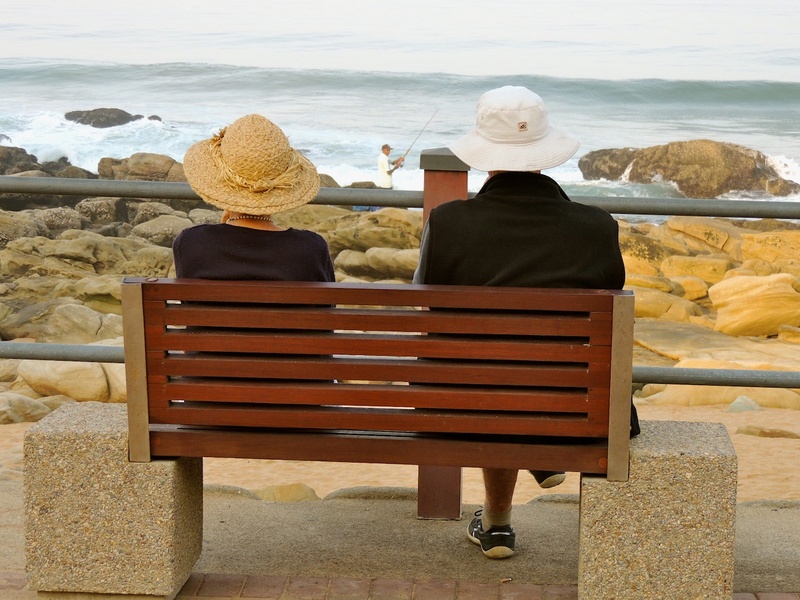 To join in the challenge, just visit Jude’s ‘Benches at the Beach’ post. Yesterday was the BIG day, and my darling Mom’s 90th Birthday party was a great success. My sister had organised balloons, a huge chocolate birthday cake and a very yummy snack platter. Mom’s 92-year-old best friend Marj, had rounded up some of her old friends from the church she used to attend, and of course the family were there in force, with cards and presents as well as hugs and kisses for mom. The weather was perfect and we sat outside under the trees which were shedding their tiny, dry leaves all over the food and especially the cake, so my sister spent quite a lot of time blowing the leaves off of it. All the time we were eating and chatting, a merry band of monkeys were swinging in the tree branches, waiting for a chance to swoop down and steal some snacks. 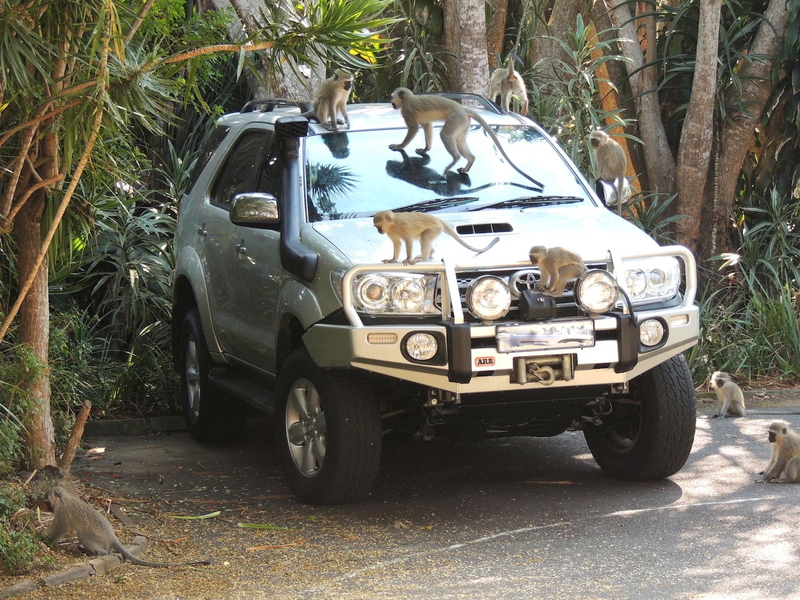 After a while, they decided that there were too many vigilant, hungry people around, so they went to play on BiL’s car instead. My mom shares her birthday with her youngest great-granddaughter Taylor, who turned 6-years-old. She phoned to thank us for her new scooter, and we had a lovely chat with our son too. 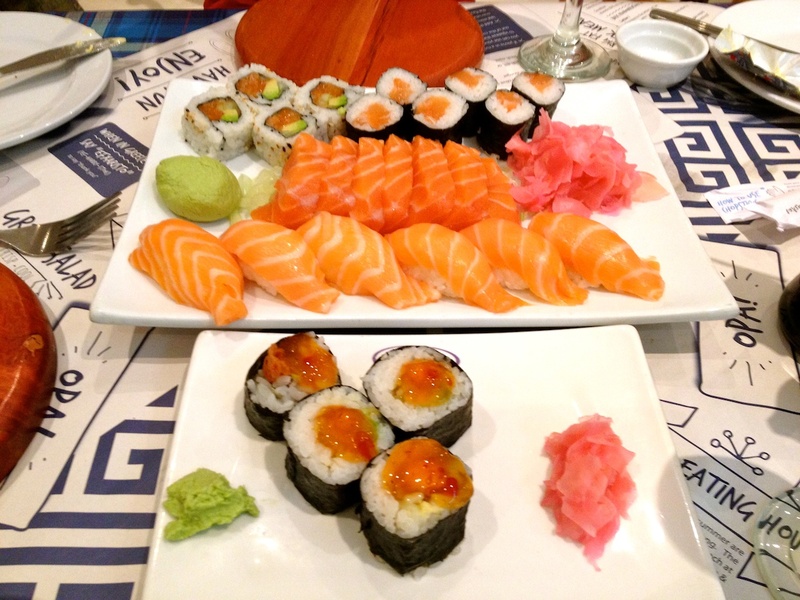 In the evening, we and our daughter went across the road for sushi, her very favourite food. Today was my sister’s birthday, so she came down to spend a few hours with us and we all had delicious Italian Bruschetta for brunch, and did some shopping, before taking our daughter to the airport. What a great few days we’ve had with friends and family. I have to say that I’ve not been feeling too well since we arrived here, but of course I had to just keep going because of all the festivities and family visits. I’m sure you’ve all been in a similar situation at some time. This morning I woke up with a bad cold, and when I opened my mouth to speak I discovered that my voice had completely disappeared. I think I must have picked up a virus either on the London tube trains, or on one of the two overnight plane journeys, so I’m grateful to have a couple of days to just collapse in a heap and hopefully recover before the weekend. Sorry I haven’t been around the blogs much. Life has been rather hectic, but I promise I’ll visit you when I get a chance. Well, our two days in London are almost over, and tonight we “sit back, relax and enjoy the flight” for 11 hours to Johannesburg. I would have enjoyed the night flight from Miami to Heathrow much more, if the temperature on the plane hadn’t been so freezing cold, and also if the guy in front of me hadn’t had his seat fully reclined for the whole of the trip. The extra space one pays for in Premium Economy is somewhat negated when the seat in front is right in one’s face. I’m sure Virgin must have added an extra row of seats and squeezed everyone up. We had fabulous sunny and warm weather for both days we were here, and took the train up to London to just wander around and do a little shopping. Eros seemed to be doing a happy dance under the beautiful blue sky. 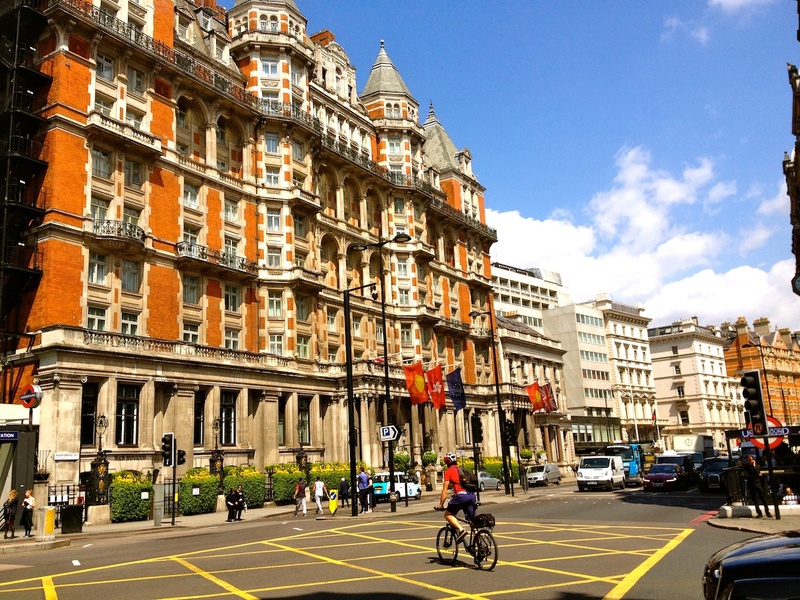 I had to take a pic of the beautiful architecture in the Old Brompton Road. Of course, no trip to London would be complete without a visit to Harrods., so we took the tube to Knightsbridge, and had a good browse around the amazing and pricey merchandise on all seven floors. A million square feet of luxury and everyday items, and all I bought was a box of crystallised ginger for my mom. 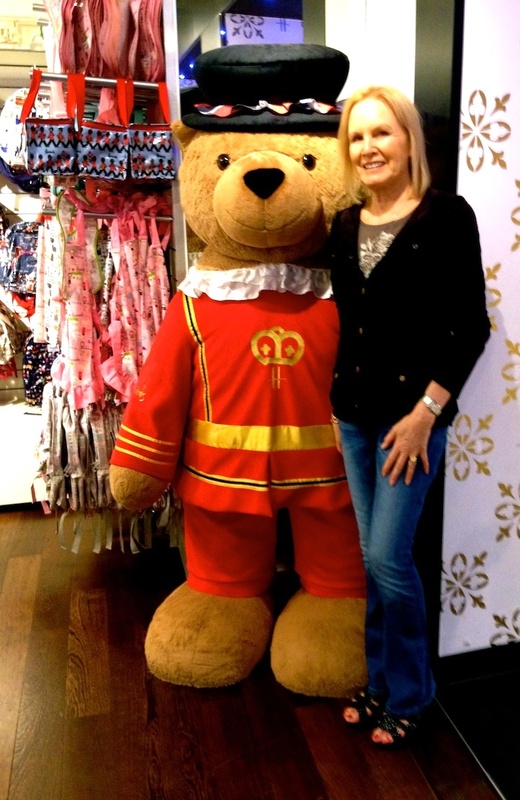 I couldn’t resist having my photo taken with this giant Harrods teddy bear. 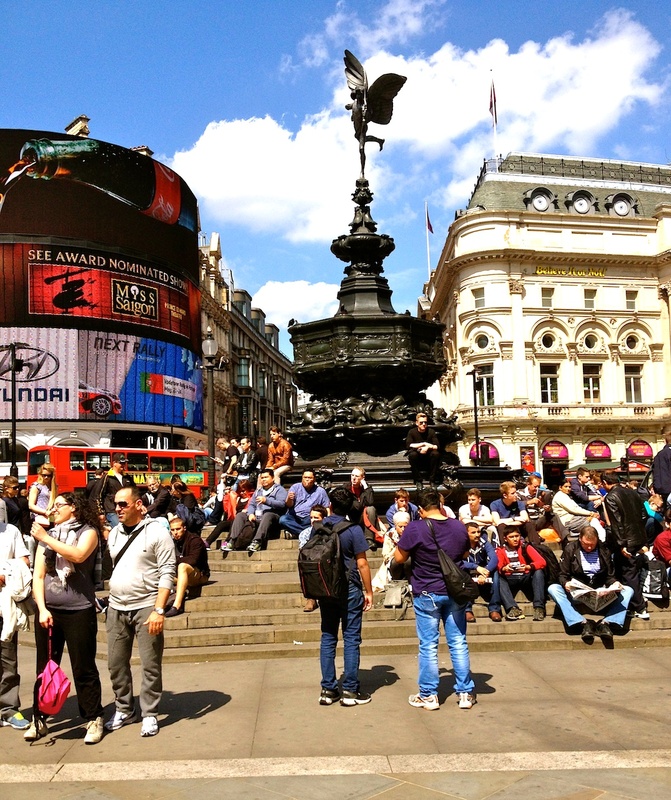 We walked our legs off around London’s streets, looking at nothing in particular and everything in general. There’s just something so unique about this city, and although it’s terribly crowded and noisy, there’s always something to admire. 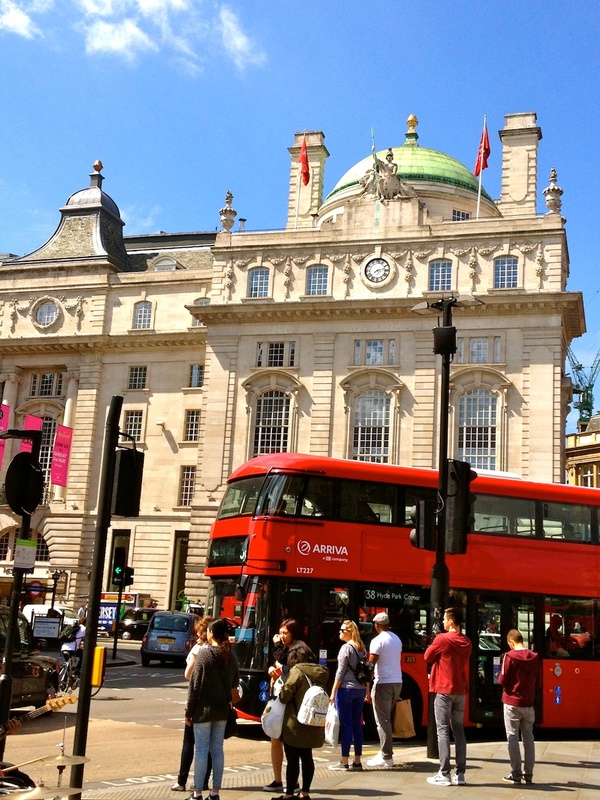 Here’s the historic London Pavilion, and the inevitable London red bus. Do any of you know what the statue is on the top? One thing I didn’t get a photo of, was the metallic gold Ferrari convertible which roared away from the traffic lights like a bat out of hell with attitude. 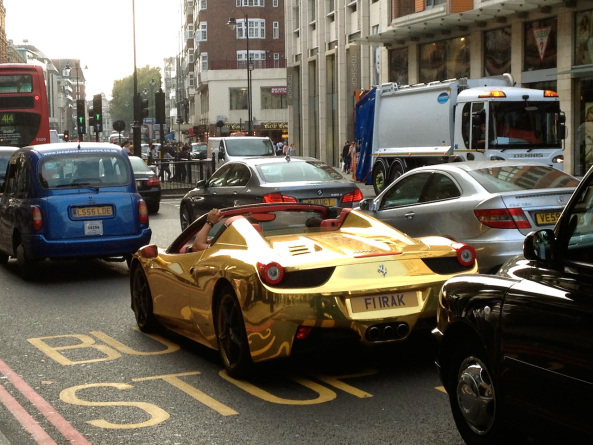 The last time we were in Knightsbridge, I saw this Gold Spider 458, so maybe the owner had swapped it for the latest model. Too much money, so little taste. In a few minutes we’ll be on our way to Heathrow to await our eleven hour overnight flight to South Africa, and tomorrow we’ll be driving down to the coast, where we’ll meet up with our daughter who is flying down from Johannesburg. I’m so looking forward to seeing her, as well as my sister and my mom. See you on the other side of the ocean. The day has finally arrived. After all the agonising over our Green Cards which luckily arrived in the nick of time, we are more or less packed and ready to leave. The washing machine is merrily singing away, my orchid has gone to a friend’s house for a holiday, and time is on my side. 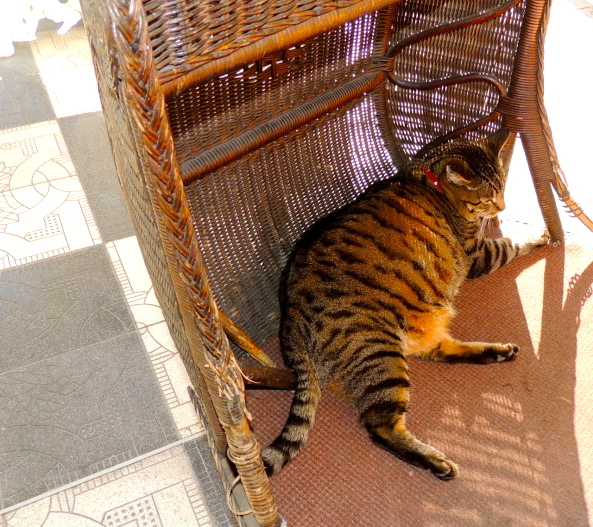 Over breakfast this morning, I looked at our South African news site, and was dismayed to see a report that Skabenga, the Oyster Box Hotel’s friendly resident cat has gone missing. Some of you may have seen him on my birthday blog a couple of years ago. The report says that he didn’t seem too well over the weekend, and was booked for a vet’s appointment on Monday, but disappeared on Sunday. He has never been known to leave the hotel grounds before, and there is a search party out looking for him and also an appeal on their FB page. I do hope he’s okay. 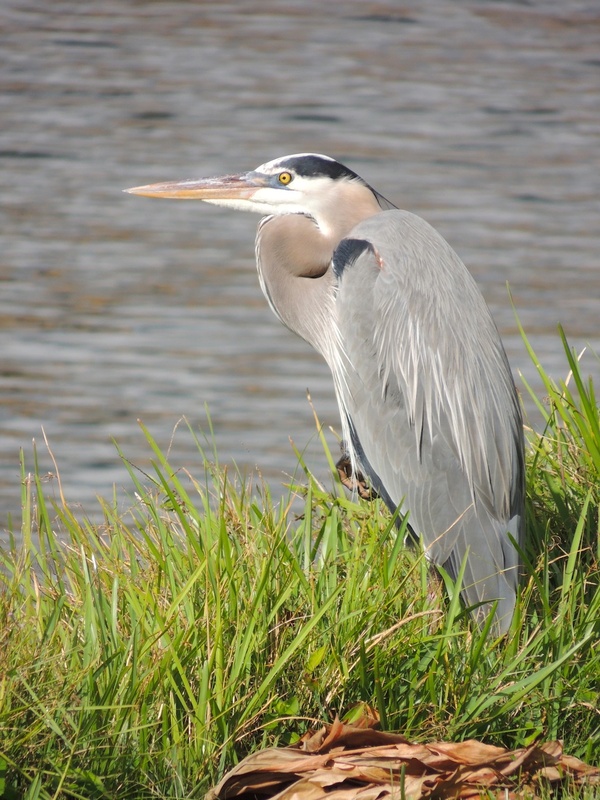 My usually friendly Mr. GBH seems to be sulking since I told him that I’m going to be away for six weeks, and that there’ll be no more photo shoots for a while. PS: I’ve just seen a report that Skabenga has been found in Phoenix, a township a few miles away from Umhlanga, and has been returned to his posh home just in time for High Tea. So all’s well that ends well, but to have been found so far away, he must have been ‘catnapped’. I’m sure he was less than impressed. There was a generous reward offered, plus a one night stay at the 5 star hotel. It certainly does make one wonder. Next time you see me, I will be in London for a couple of nights, recovering from jet lag. Have a great rest of the week. I shouldn’t really be sitting here on my computer, but I just had to post this pic for Jude’s Bench Series, whilst she’s still looking for ‘Benches on the beach’. 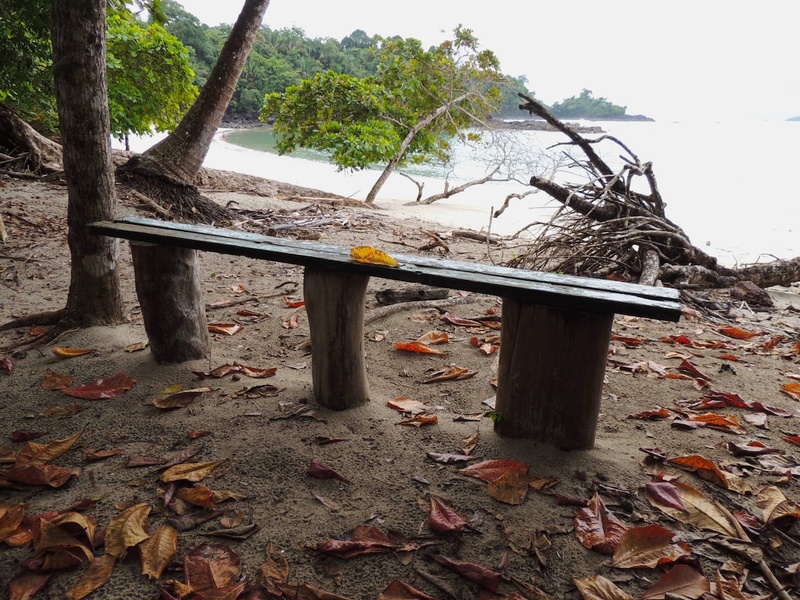 I found this bench in the Manuel Antonio National Park, Costa Rica. We’d been for a hike through the park, and came down onto this deserted stretch of beach, which as you can see is rather wild and unkempt. Not a sunbathing type of beach, or an ice cream vendor’s paradise. Right, now that’s done, I must get back to my packing. It’s really difficult deciding which shoes to take and which to leave behind. Decisions, decisions. 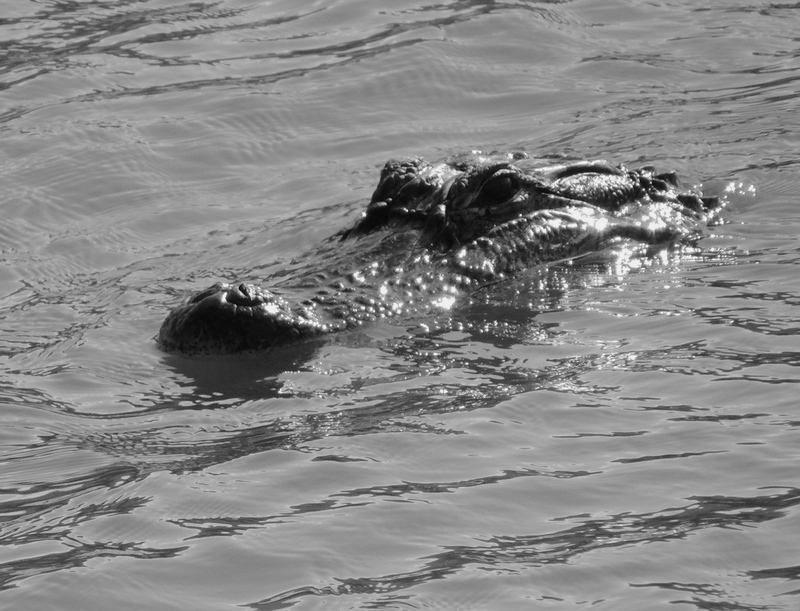 Cee’s B&W Photo Challenge: Surrounded by liquid. I took this photo from my backyard a couple of days ago. 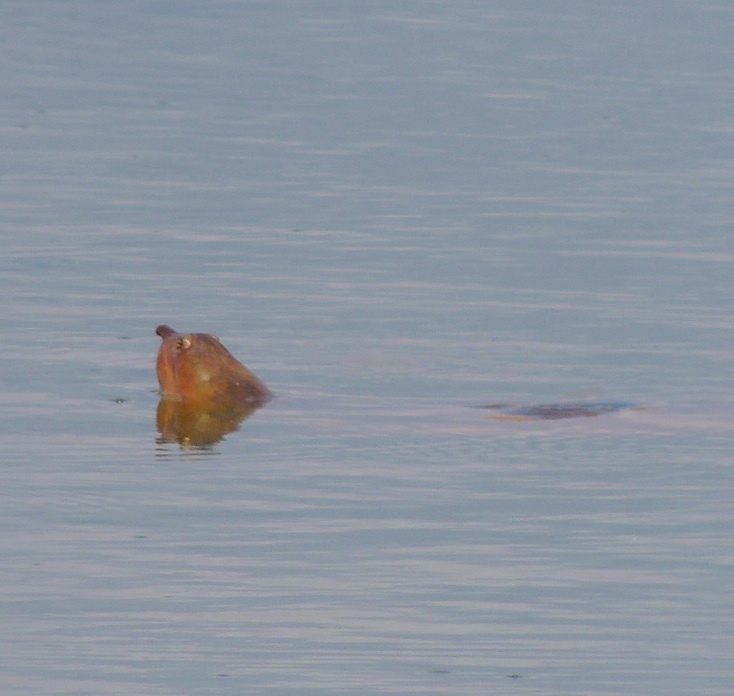 Mr. A did seem rather close to the bank, but as long as he remains surrounded by ‘liquid‘ and I’m on dry land, I feel quite safe. I’m going to miss him while we’re away. Click Cee’s badge to see more entries for this week’s B&W Photo Challenge. I’m also linking this to the ‘My Sunday Photo’ Challenge. Here are a few pics from our day out yesterday to celebrate hubby’s birthday. First stop was for lunch at ‘The Grand Lux Cafe’ in Boca. 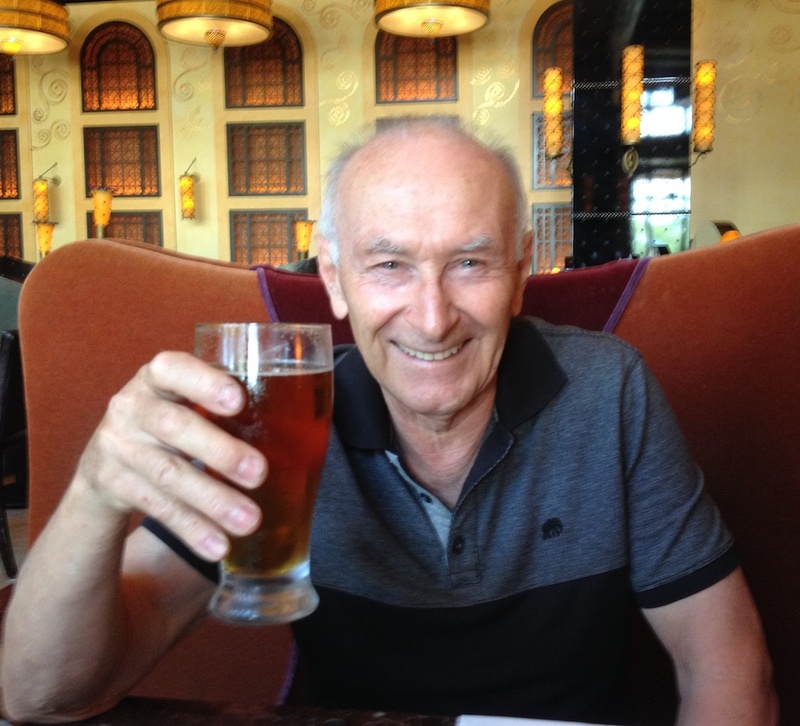 This restaurant has really elegant decor, a huge menu to choose from, as well as great service Hubby toasted his 71st with a very welcome ice-cold ‘Samuel Adams’. 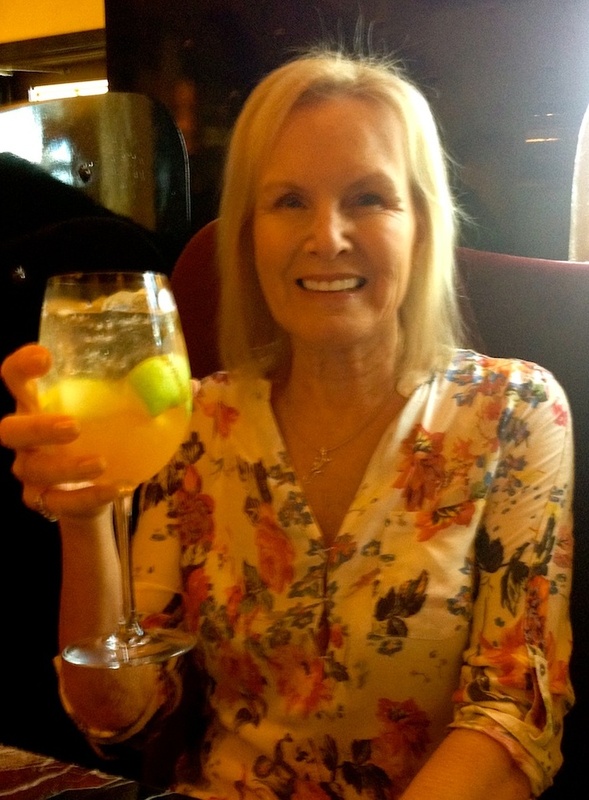 My choice was a White Sangria with Pinot Grigio, Champagne and Fresh Fruit. 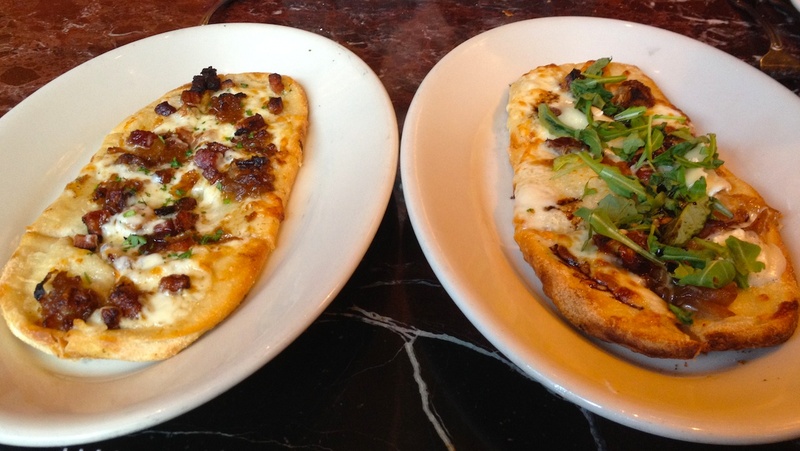 We decided to snack on shared starters and small plates. These mini pizzas were so delicious. 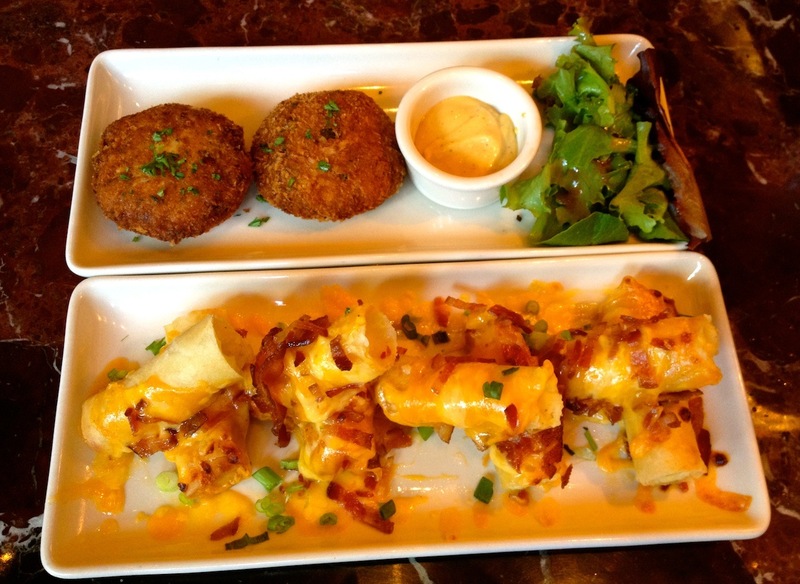 Followed by crab cakes and double-stuffed potato spring rolls. As you can see, we were on a really healthy diet. 🙂 We were longing to try the cheesecake, but had absolutely no room for it. Maybe another time. Then it was time do do a bit of shopping, and hubby treated himself to two pairs of shoes, which is quite a rare occurrence. In the car, we had a phone call from our son and the three littlies who all wanted to wish granddad a happy birthday at the same time. They are just the cutest little trio. The two girls have taken up art lessons after seeing granny’s painting. 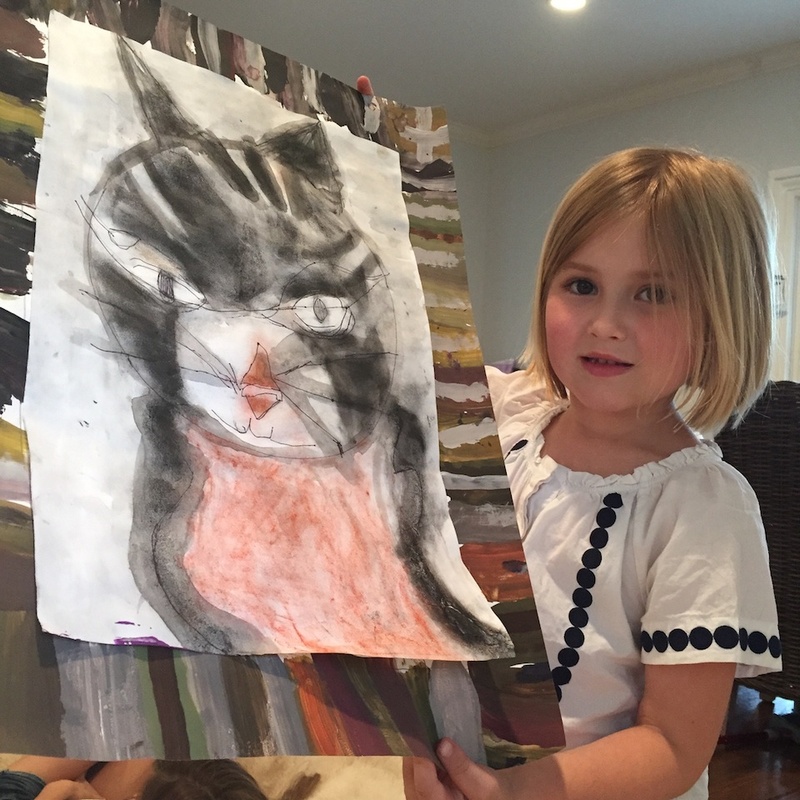 Taylor of course had to paint a cat in her first lesson. She has this thing about cats, even though at home, they only have a dog. I think she did a really good cat. Well, it’s time to get down the suitcases and start decided what to leave behind and what to take. I may not have so much time to pop in on your blogs, as we leave on Tuesday evening, and have a lot to do before then. Today hubby is over at the other house, painting walls and door frames. He has to make up for having the day off for his birthday. He’s booked our flights on Virgin, and found a super beach front apartment for us to rent for our month’s stay in Umhlanga Rocks. It has sea views from every window. We’re so looking forward to our trip, and a week tomorrow we’ll be picking up our daughter and going off up the hill to see my mom. Wishing you all a splendid weekend. 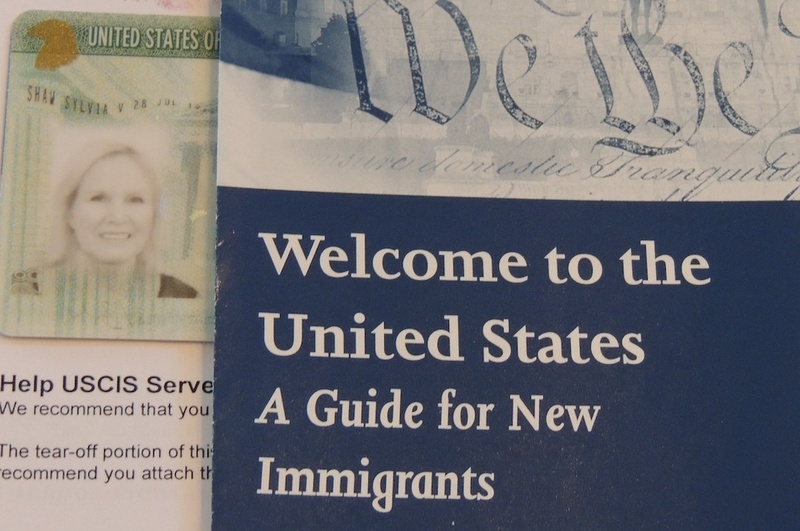 There was great excitement and relief here yesterday when the mail man delivered two priority mail envelopes containing our beautiful and long awaited Green Cards. I was surprised to see that they are actually green and not white, as someone had once told me. I’m even quite pleased with my photo, as on i.d. documents I usually end up looking like an alien. Now it’s all systems go for our trip over to South Africa. The flights are booked for Tuesday, and hubby has found a lovely 3-bedroomed beachfront apartment for us to rent for a month. 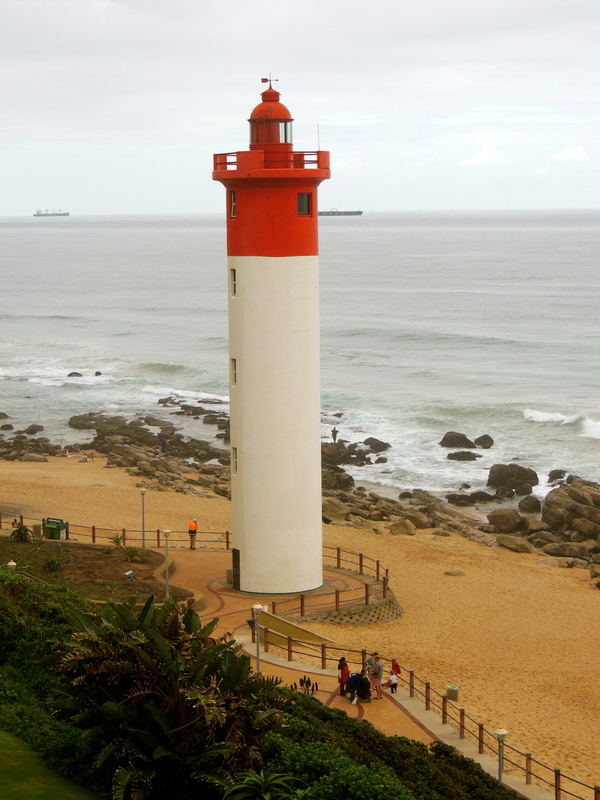 I’m so excited to see my gorgeous Umhlanga lighthouse again. 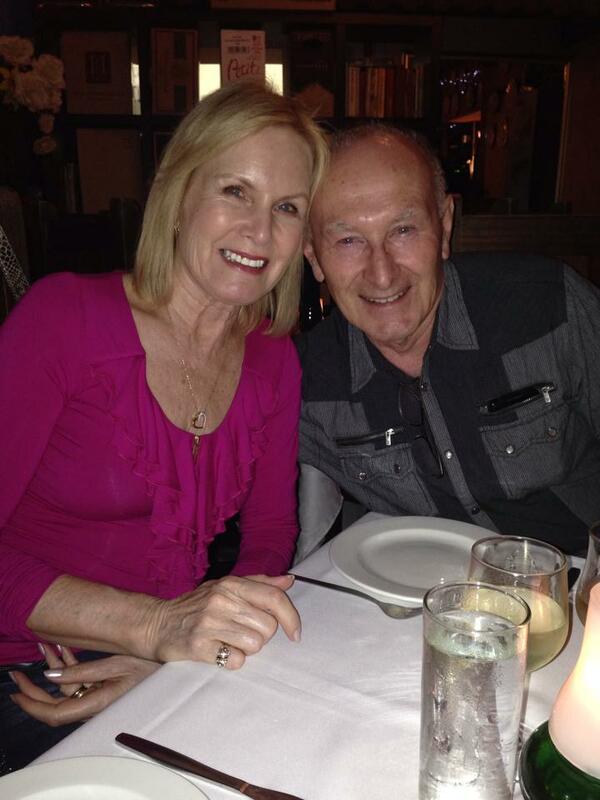 We’re going out for the day to celebrate with a fabulous lunch at the elegant Grand Lux Cafe, and to do a bit of shopping for his birthday present and also for gifts to take over for the family. He’s decided to give himself the day off from doing house renovations. It’s coming along very well, and we should be able to move in by December. Wishing you all a fabulous weekend. I’ll catch up with your blogs a bit later. Elaine of ‘I used to be indecisive’ blog, has nominated me to do the ‘5 Photos, 5 Stories’ challenge. My final photo was taken in the Southern Black Forest Nature Park in Germany. Almost two years ago, to celebrate her 100th birthday, my Mom-in law treated her immediate family to a Rhine cruise. When our ship docked in Breisach, we set out for a half hour mini-hike through the picturesque landscape of the Black Forest. After passing mountain goats grazing amongst the rocks, the trail became quite steep and the ground underfoot, very rocky, so we left MiL sitting on a large boulder in the shade of a viaduct, whilst the rest of us climbed to the top. 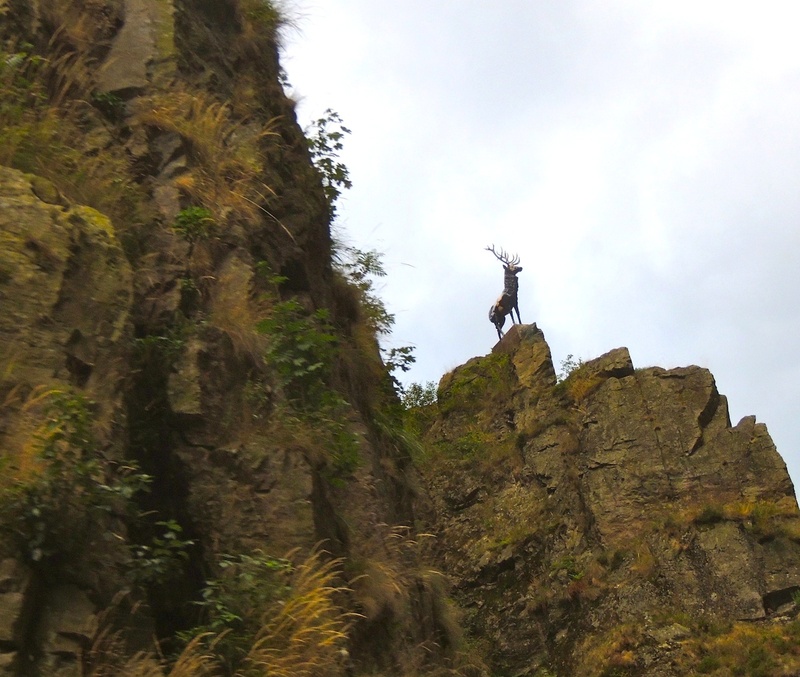 The bronze statue of a stag overlooking the ravine, is a reminder that such an animal once escaped hunters with a gigantic leap across the gorge. I don’t know whether it’s a true story or just a legend, but the statue is really amazing to see. At this point, I’m supposed to nominate another blogger to take up the challenge, but haven’t had much success so far with this, so I’ll leave it open for any of you who may like to do it. The challenge is quite simply to “post a photo each day for five consecutive days and attach a story to the photo. It can be fiction or non-fiction, a poem or a short paragraph and each day nominate another blogger for the challenge”.